If you are interested in any of the items or have any questions, please email info@daydreamsfarm.com with zip code for shipping or to arrange pick up at the farm in Marine City, MI. We can send you a Paypal invoice. We cannot hold any item without full payment. There have been too many no shows. Brand new with tag attached. 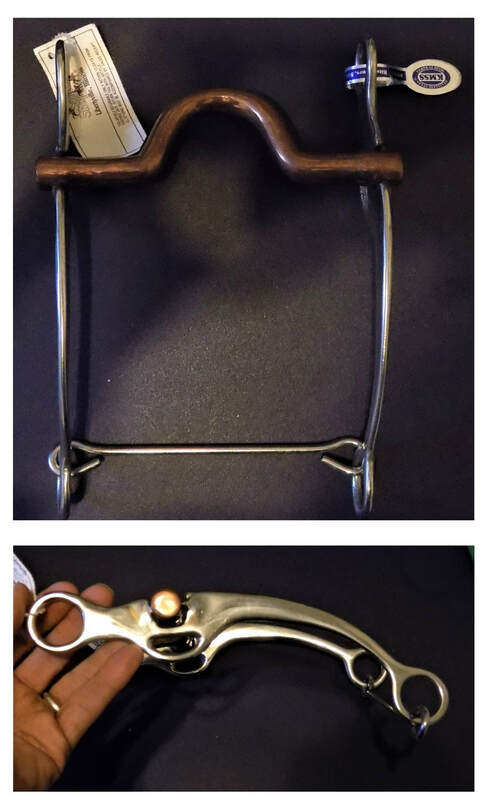 Horse size anti-grazing muzzle with halter. 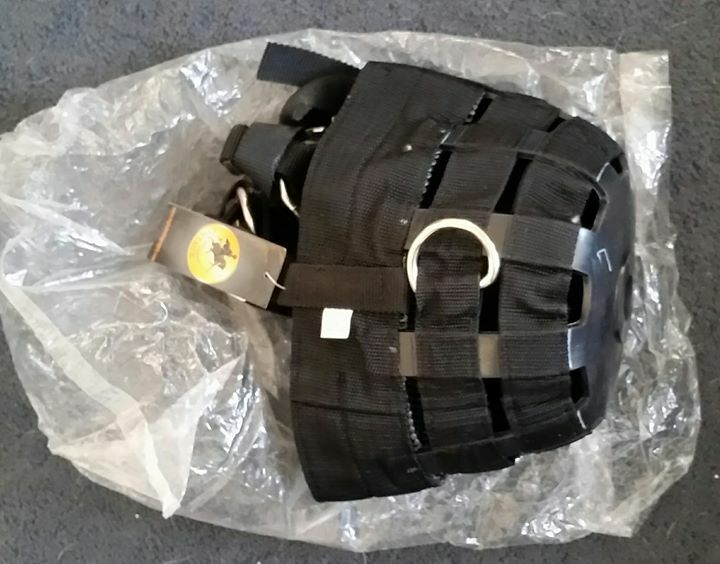 This harness isn't made of cheap leather. 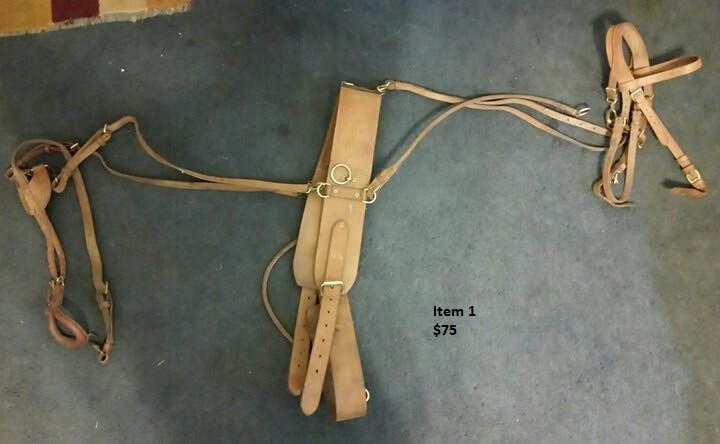 The leather is very heavy duty and the buckles, snaps and rivets are all brass. Has a removable running martingale and overcheck. It has tons of adjustability and will go from cob size to full horse size. It could use a good cleaning but this is an expensive, well made training harness. No bit and no reins. I bought these not realizing I already had two sets of them. I paid 59.95 at our local store but lost the receipt. I'm just trying to recoup some of my money. They are brand new in the original package. ​They are the wider blocks. Brand new in original package. Quilted Roma pad, 23x24. This is a beautiful pad. Brand new in original package. 20 wide x 26 long. Brand new in original bag. 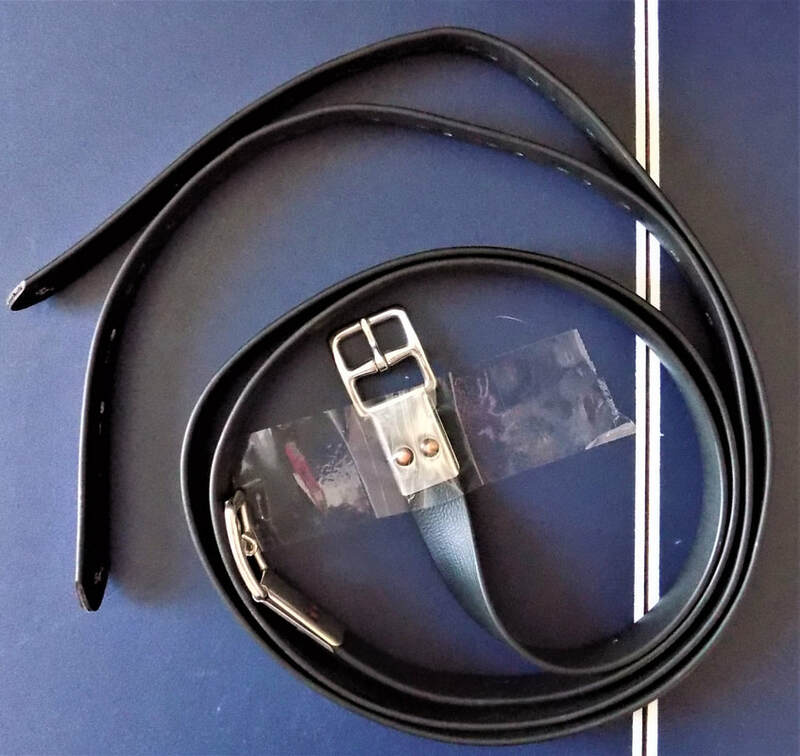 Black with zippers and snaps at each end. 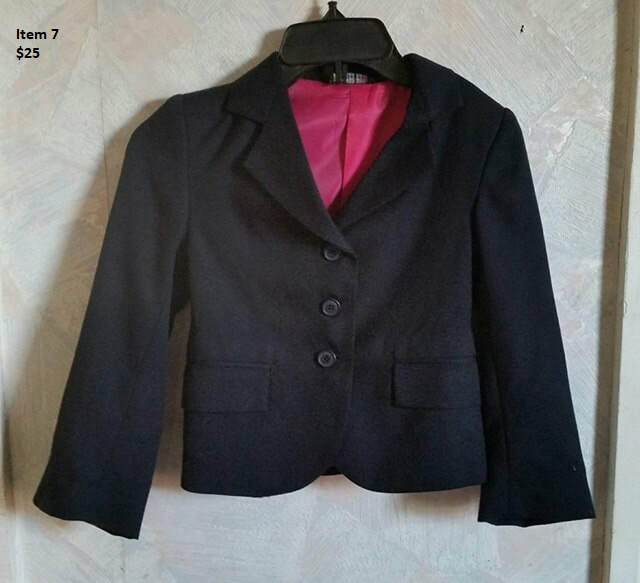 Fits calves 12" and fits length of 16 to 17". Beautiful, quality chaps. 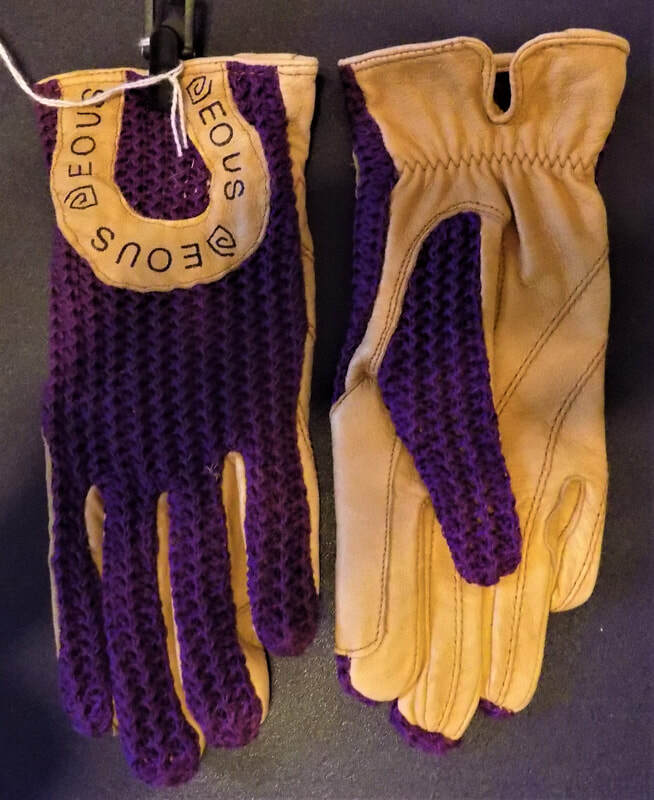 Eous Brand Gloves are brand new with tags still attached. Super, nice quality gloves. 5" Sweet Iron Mouth, 7 1/2" cheeks. Brand new with tags attached. Bit is tagged $38.50. KMSS Brand 5" copper mouth, high port. 7" swivel shanks. Brand new with tags attached. 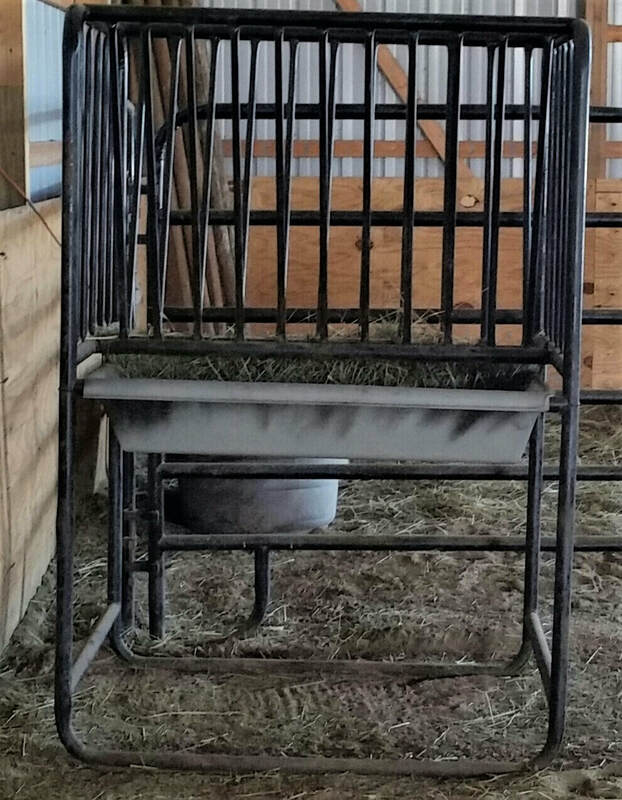 I have two hay racks to sell. $150 each cash. Price is firm. That's what I paid for them before we fixed the rust on the bottoms. They are 3 1/2 feet long by 5 1/2 feet high. They're the same racks you can find at TSC. Absolutely no holds. If you want to pay via Paypal and store them here until pick up, that's fine, but a $5 fee per unit applies to cover my Paypal costs. Can deliver for an extra fee. 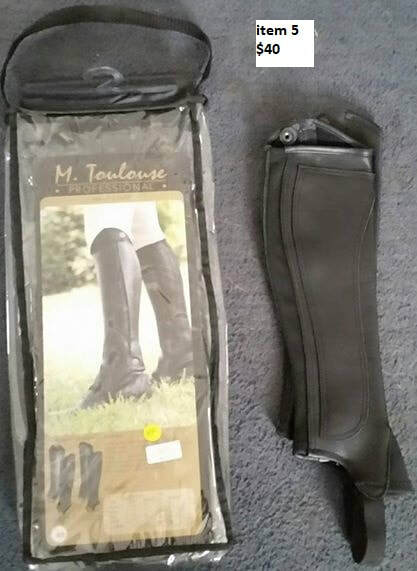 These breeches are brand new with tags still attached. Size 12 youth. Two zipper pockets and brown knee patches. The breeches are a bit louder green than the picture depicts. They are really cool looking breeches. Beautiful black children's hunt coat. Devonaire Concour Elite. Certainly nice enough to show in. If interested, please email info@daydreamsfarm.com with zip code for shipping or to arrange pick up at the farm in Marine City, MI. Cannot hold any item without full payment. Too many no shows. Thanks. Brand new in original package. 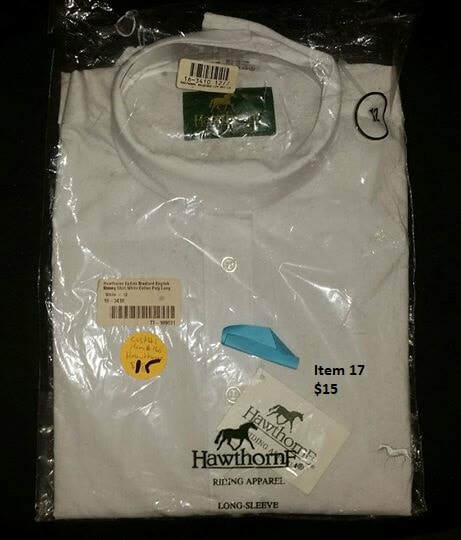 White long sleeve rat catcher. Ladies size 12. Brand new with original tags, box and carry bag. Brown in color. Size tall large. Brand new in original bag. 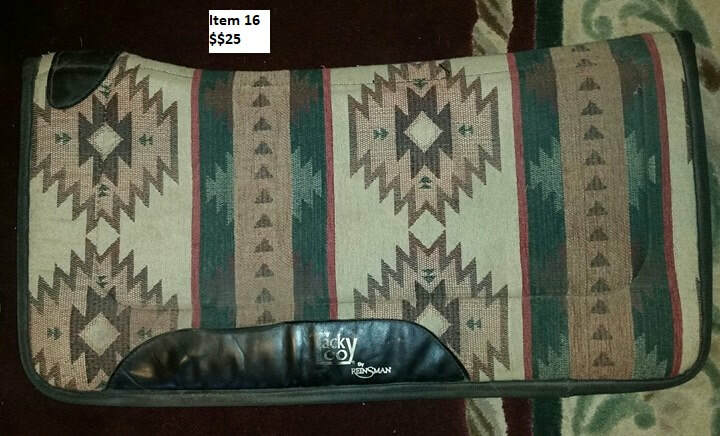 ​​Reinsman Tacky Too western saddle pad. Heavy duty. 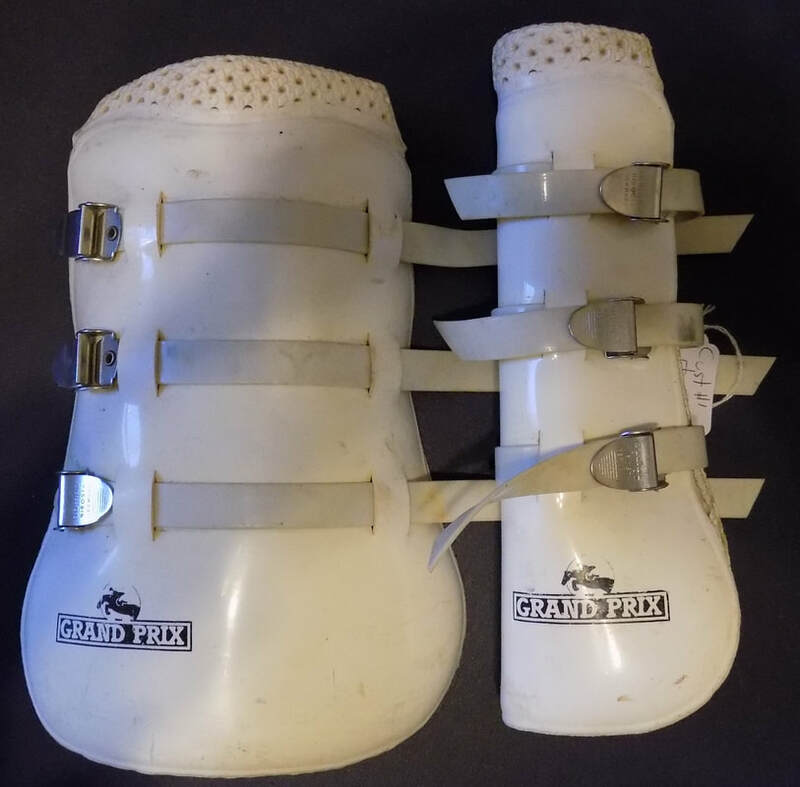 This pad is super heavy duty and has very little wear, only wear seen is on the wear leather. 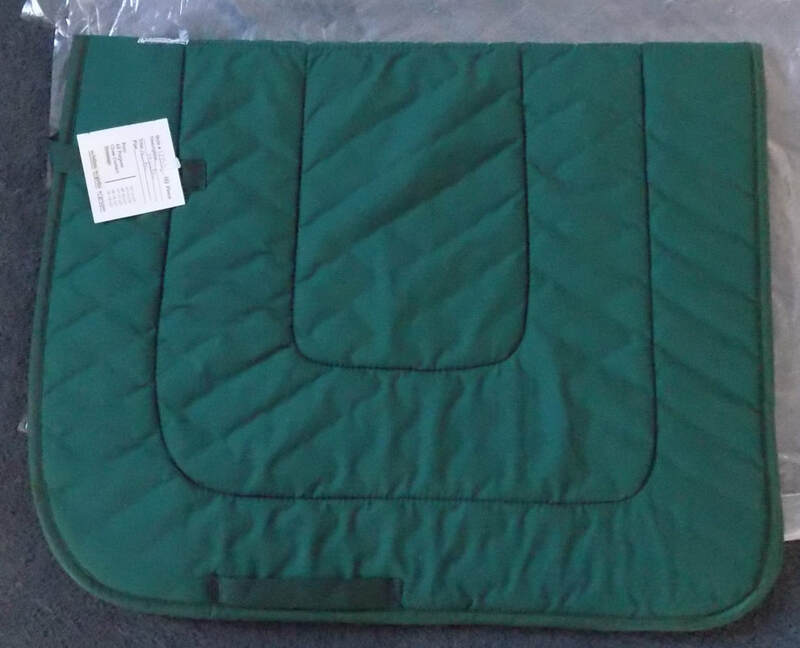 The underside is in perfect condition and there are no rips or stains anywhere on the pad. Absolutely nice enough to show in. Pad weighs 7.1 pounds. 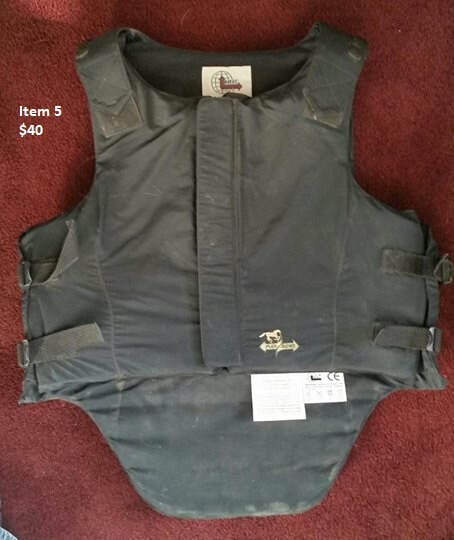 Terrific schooling or entry level vest. Zipper and all velcro works. Hawthorne brand riding breeches in hunter green. Size 24R. New with tags. Suede knee patches in same color. Medium weight. Super nice breeches for the price. Located in Marine City.Br and new in original bag. Really cute fleece rug /cooler. 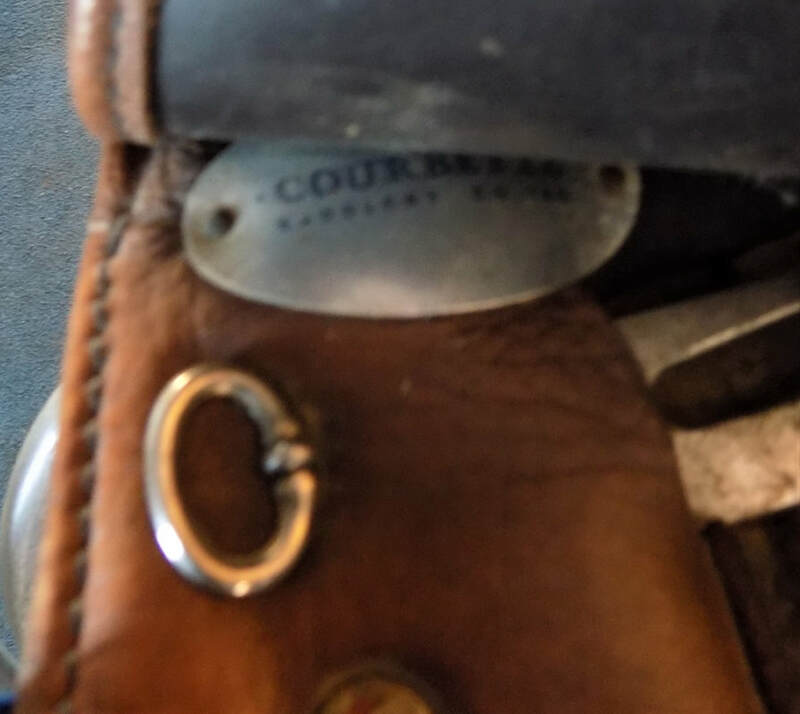 Has one chest buckle and two crossed surcingles. Get noticed! 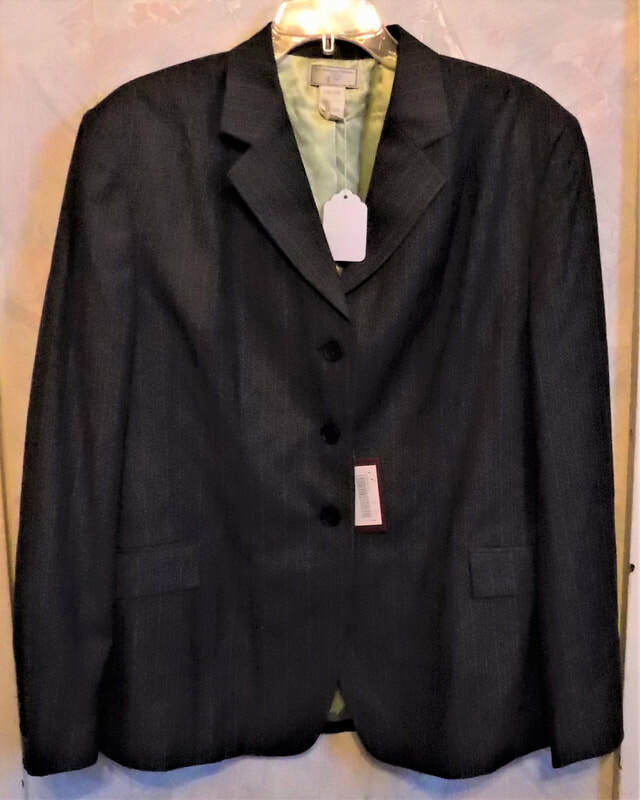 Brand new with tags attached. Made by Hi-line. Red with tan suede knee patches. Pockets on both legs. I have this same pair in adult size and I LOVE them. Your child will never get lost on the trail. Brand new with tags attached. 5" full cheek, double mouth. Brand new with tags attached. 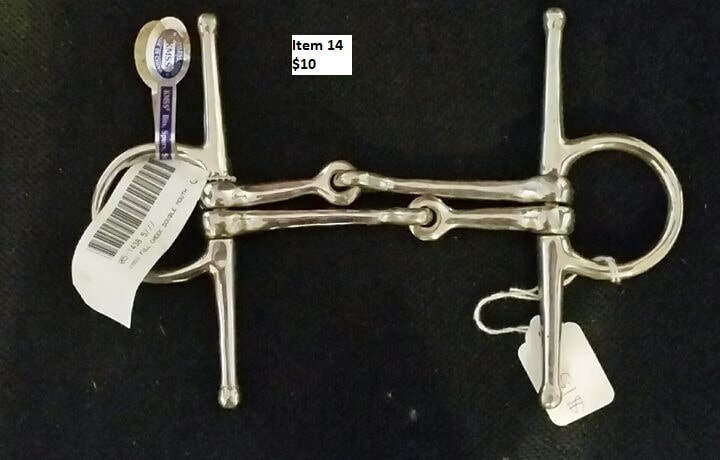 Half cheek single jointed snaffle. 4 1/2". 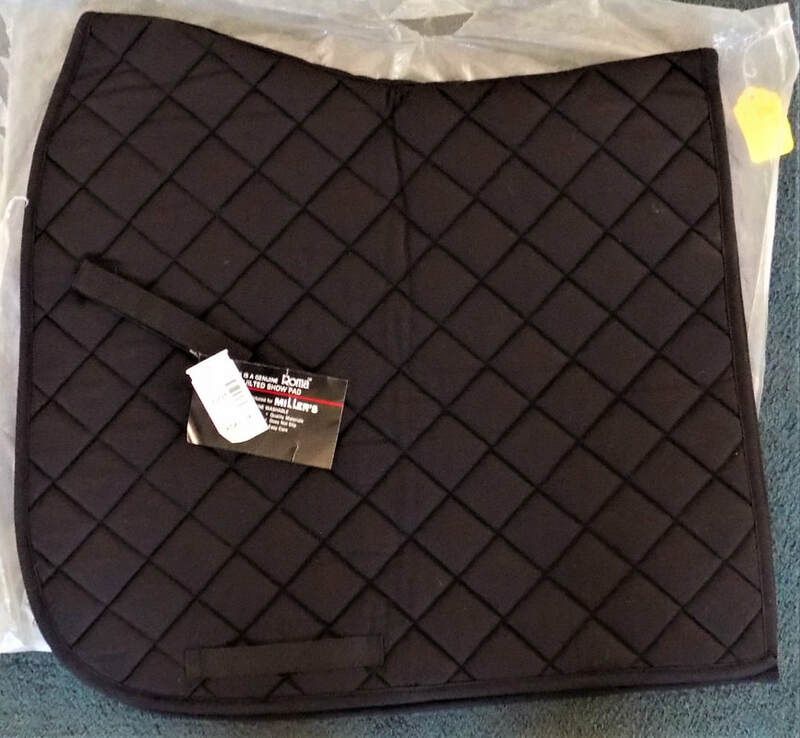 Professional's Choice Black Dressage Girth-26"
Black neoprene dressage girth. In very good, usable condition. No cracks in the neoprene or excessive wear. 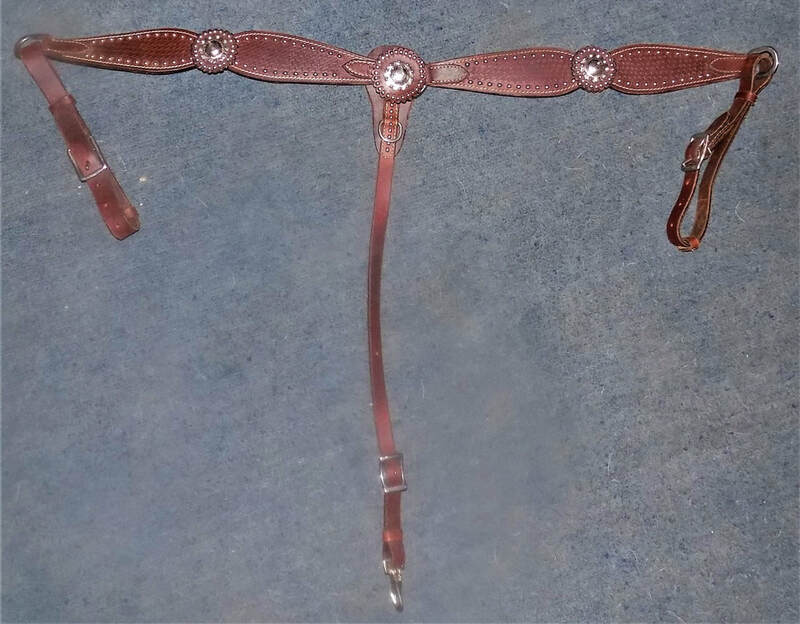 Girth is 26" from buckle to buckle. If interested, please private message with zip code for shipping or to arrange pick up at the farm in Marine City, MI. Cannot hold any item without full payment. Too many no shows. Thanks. 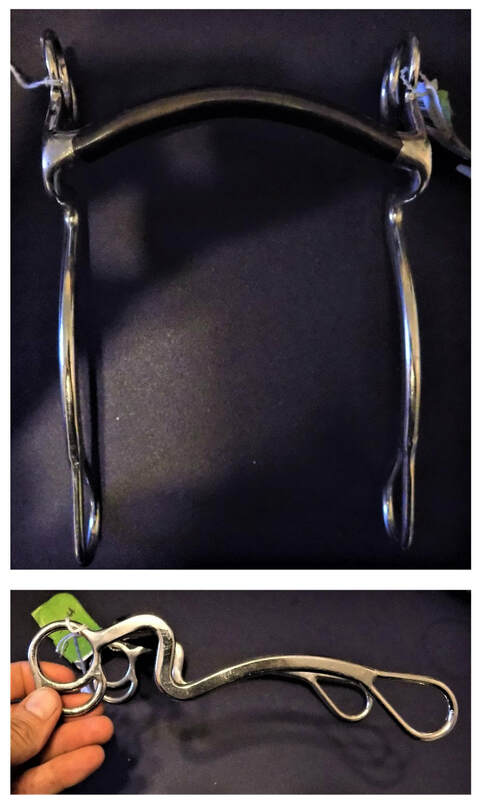 Single jointed loose ring pony snaffle in good, usable shape. If interested, please private message with zip code for shipping or to arrange pick up at the farm in Marine City, MI. Cannot hold any item without full payment. Too many no shows. Thanks. 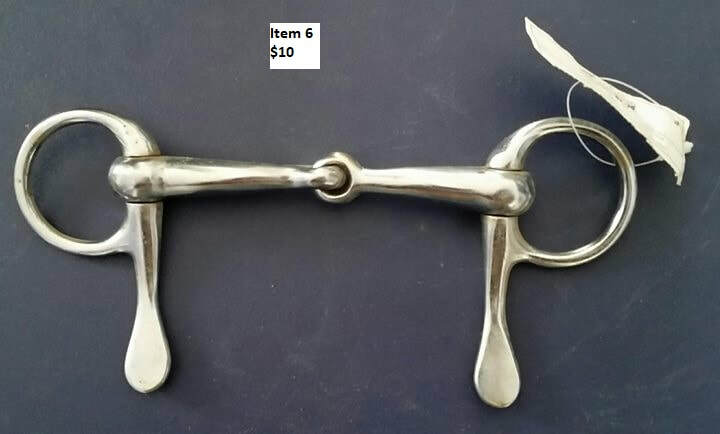 Korsteel loose ring snaffle in good, usable shape. If interested, please private message with zip code for shipping or to arrange pick up at the farm in Marine City, MI. Cannot hold any item without full payment. Too many no shows. Thanks. 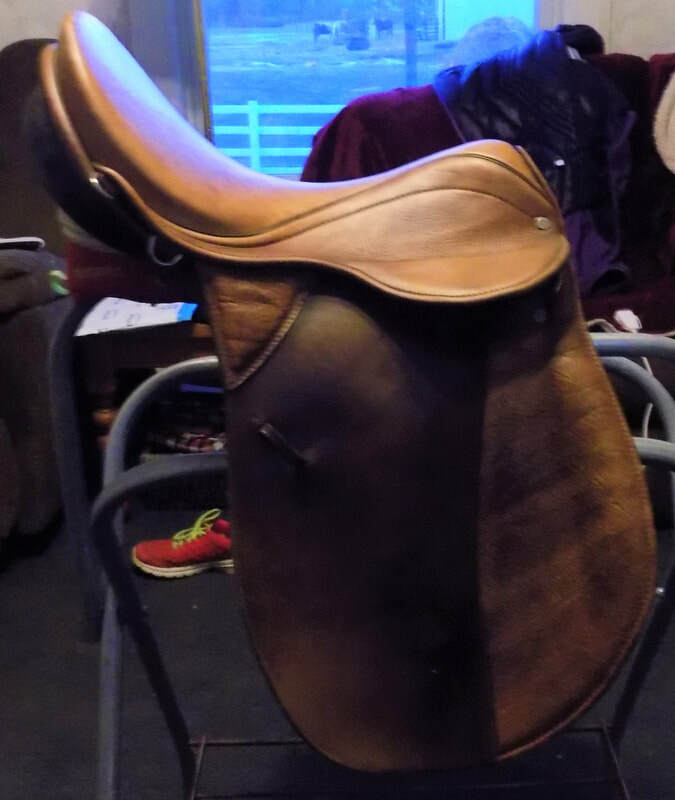 I bought this as a lesson saddle without realizing it's the WIDE model. The smallest gullet plate you can put in it is extra wide. 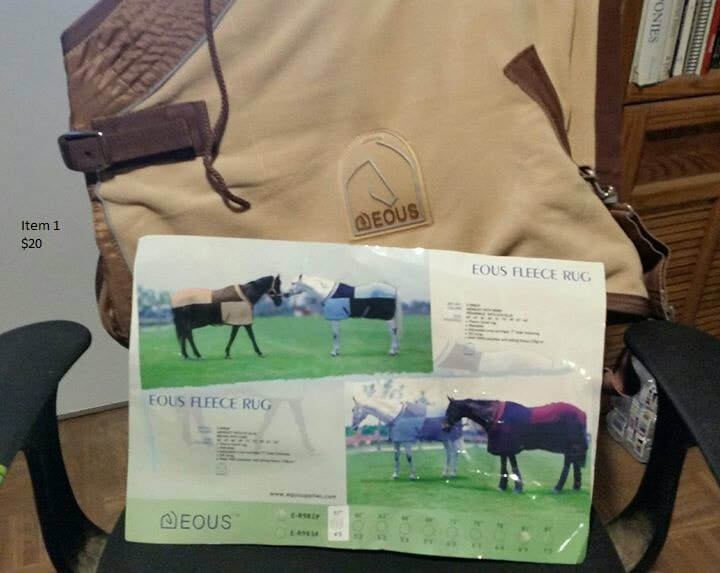 This saddle is made for drafts, draft crosses and horses with super wide backs. It had 3 rides in it when I bought it and I never used it. 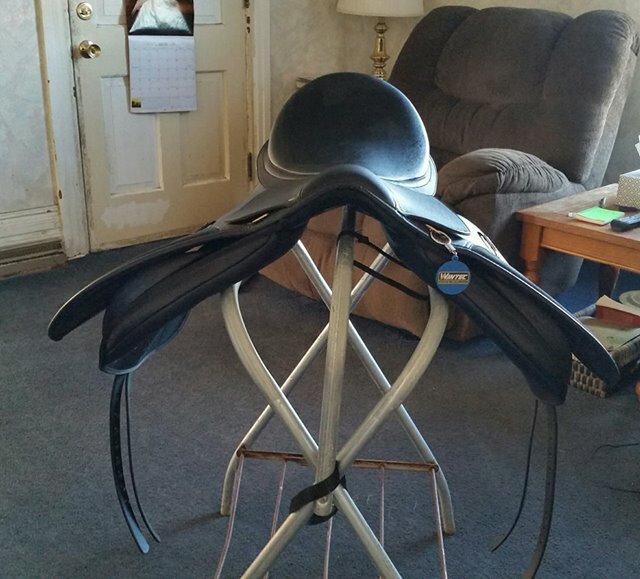 It has dressage billets, but very slightly forward flaps so I would consider it an all purpose saddle. There are no stains on the sides. It must still have been a bit wet from wiping it off when I took the photo. 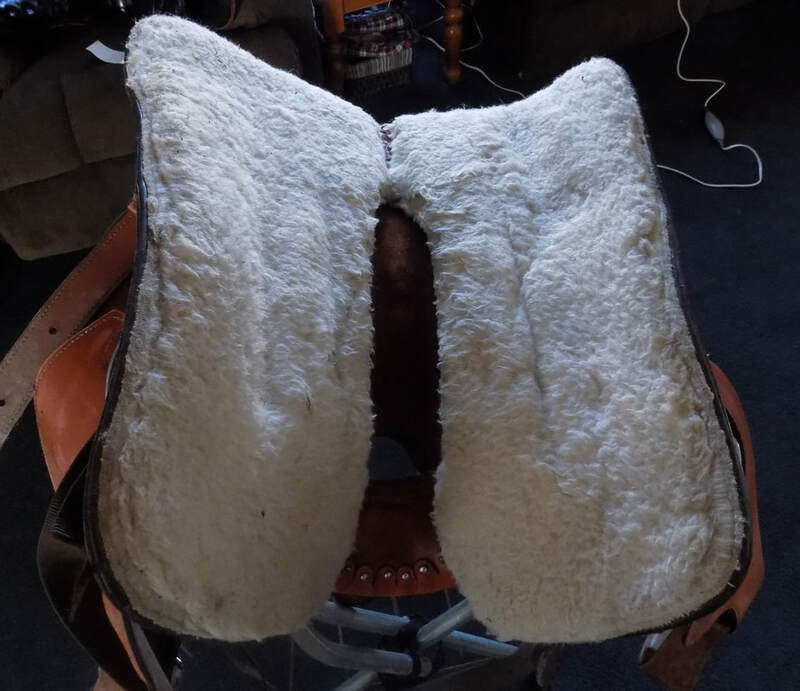 This is an excellent saddle for the hard to fit horse without spending a fortune. $375 shipped or $350 pickup at the farm. 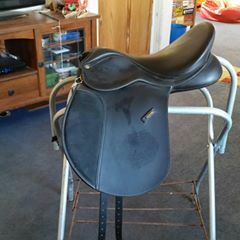 TSI Work Western Saddle. Nothing wrong with it. Tree is sound. It has a nylon billet and a leather off billet. This saddle weighs about 32 lbs. 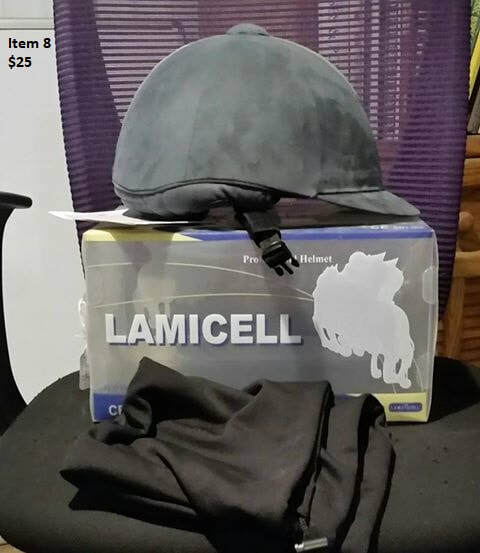 Excellent starter saddle. Needs a thorough cleaning and is priced accordingly. 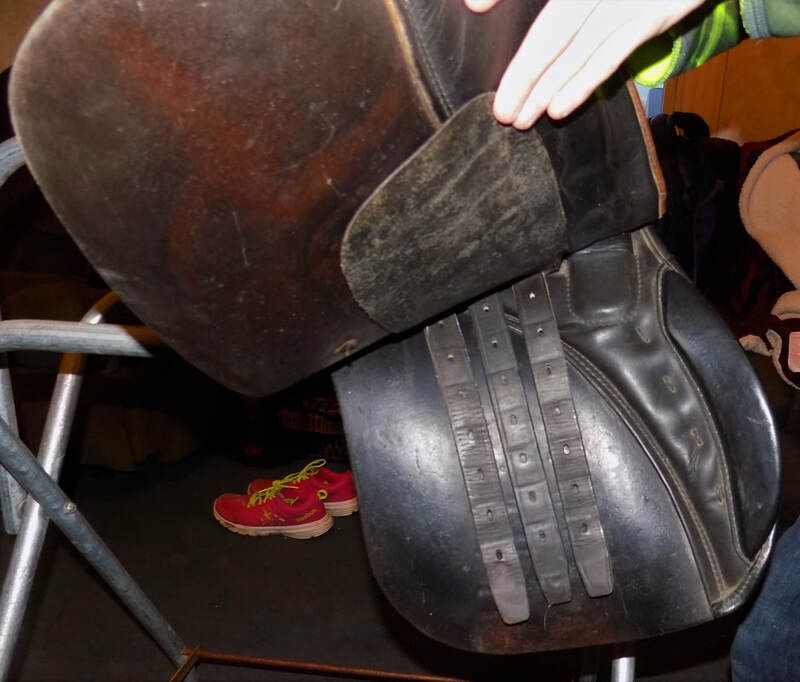 Saddle is in very good, usable condition. Color is distressed from the manufacturer. 17" seat. 4 1/2" tree. Tree is absolutely sound. 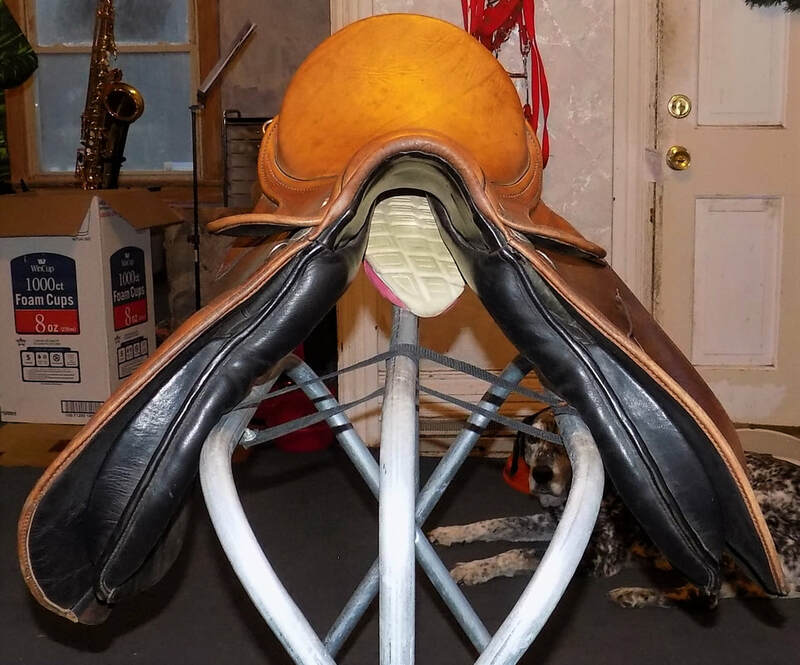 This is a terrific entry level saddle. No cracks or excessive wear. Billets are in fine condition. 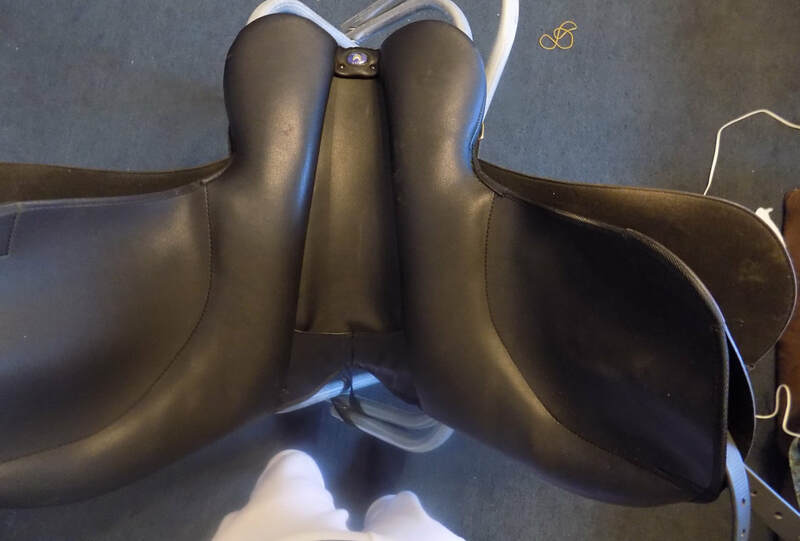 Offers a lot of support with the higher cantle and knee rolls. I'm seeing these same saddles on Ebay for $300 to $375. I can provide more pictures in comments upon request.